Luffa or ridge gourd is an elongated, cylindrical fruit pod in the cucurbitaceae/gourd family of vegetables. Its young, tender and mild flavored pods indeed are one of the very popular vegetables featuring in the Indian, Chinese and Filipinos cuisine. Scientific name: Luffa acutangula (L.) Roxb. Luffa are also known as patola (Filipinos), angled or ribbed luffa, silk gourd, dishcloth gourd, silk squash, and Chinese okra, Sin qua, etc. Ridge gourd. Note that long, cylindrical, green pod on the vine. Ridge gourd (L. acutangula) is the most common cultivated variety. Its surface is covered with ridges that run along its length. Smooth luffa (L. cylindirca) is larger and more cylindrical, with a slightly thicker base. Its skin is smooth like that of cucumber. The interior of immature fruits in both varieties features smooth yet crunchy flesh and tiny soft seeds. If left to grow further, it quickly increases in size and develop a network of fibers tissue and seeds become hard and inedible. Ridge gourd is one of the very low calorie vegetables- carrying just 20 calories per 100 g. Its delicate, sponge-textured flesh consists of moderate levels of minerals and vitamins in addition to being rich in anti-oxidants. Both cultivars (ridged and smooth varieties) compose phenolic anti-oxidants such as carotenes, lutein and crypto-xanthins. Fresh pods contain 7 μg of folates. In the expectant mothers, folate-rich food may help in reducing the incidences of neural tube defects in the newborns. Angled luffa has more vitamin-A than many other gourd vegetables. 100 grams of fresh fruit composes 410 IU (14% of DV) of vitamin A Vitamin-A is essential for the mucosal integrity, health of skin, hair and vision. It also works as anti-cancer, anti-aging factor at cellular level in the humans. Fresh ridge gourd is a small source of vitamin-C (100 g of raw fruit provides 12 mg or about 20% of RDA). Vitamin-C is one of the powerful natural antioxidants that help the human body scavenge harmful free radicals, which labeled as one of the reasons for cancer development. Being rich in dietary fibers and smooth flesh, luffa facilitates easy digestion and easy movement of food through the bowel. Thus, it helps in relieving indigestion and constipation problems. Further, it is aslo an average sources of B-complex vitamins such as thiamin, niacin (vitamin B-3), pantothenic acid (vitamin B-5), pyridoxine (vitamin B-6) and minerals such as calcium, iron, zinc, potassium, manganese and magnesium. fresh, raw, Nutritive value per 100 g.
In the tropics, ridge gourd is available all round the season. Look for fresh, tender angled luffa in the local farmers markets. Choose immature, green, firm pod with long intact, healthy stem. Avoid oversize, mature, as well as limp, soft fruits as they indicate old stock and out of flavor. Also avoid those with surface cuts, cracks, bruised or broken. Fresh luffa does not last long. At home, store them in the vegetable compartment of the refrigerator and should be used within two or three days of purchase before it begins to limp. Wash in clean water to rid off any surface dirt, and sand. Scrape the ridges and slice the fruit of desired size using a paring knife, leaving the skin in between so that the luffa is striped green and white. If the skin is very tough, it is best to peel it off completely. Like in squashes and gourds, luffa should not be overcooked. 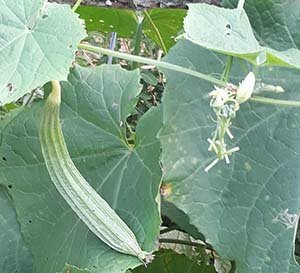 Luffa has a mild, delicate flavor and soft texture; very similar to that of bottle gourd. It is used mostly in the stir-fried dishes or soups. It goes particularly well with lentils in lentil curry and mixed-vegetable stews. Peeled, freshly harvest ridge gourd may be eaten raw in a similar way like peeled pumpkin, squash, or calabash. However, the whole or partly peeled luffa should always be cooked as its skin contains unpleasant smelling compounds which make it unappetizing raw. In the mainland China, finely sliced sin qua is particularly used in and soups, and stir-fries. In Northern India, Pakistan and Nepal, turai or tori (Luffa cylindrica), a smooth skinned cultivar of ridge gourds is specially employed in stews (tori ki sabzi). Ridge gourd is a common vegetable featuring in curries/tovve/stews in many parts of South Indian states. Ginisang patola (stir-fried sponge gourd) is a traditional stew enjoyed by the Filipinos. Almondingas recipe is a traditional soup dish popular in the Philippines. It uses thin sliced patola (loofa gourd), noodles, and pork meatballs. Some luffa pods containing bitter cucurbitacin alkaloid compounds have been reported. Test a small slice for any bitter tasting and just discard them if found so to avoid any untoward episodes. (Medical disclaimer). <<-Back to Vegetables from Luffa (ridge gourd). Visit here for an impressive list of vegetables with complete illustrations of their nutrition facts and health benefits.